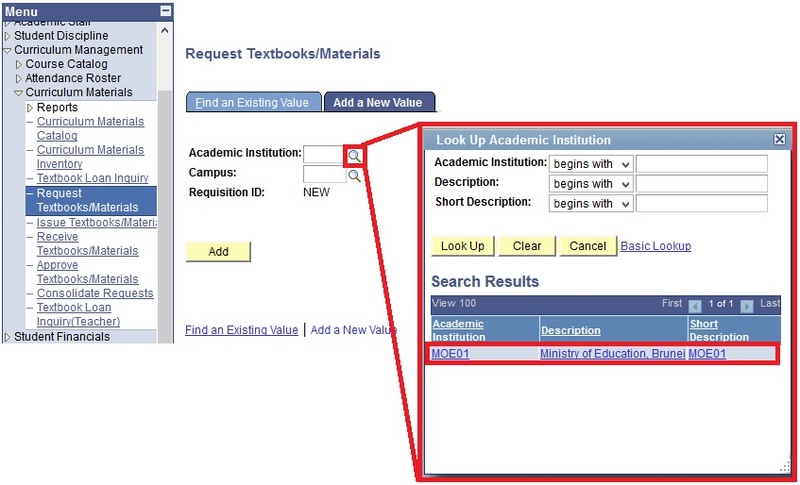 This function allows the users to submit request for number of new or existing textbooks/materials. Roles Involved: School Textbook Officer. 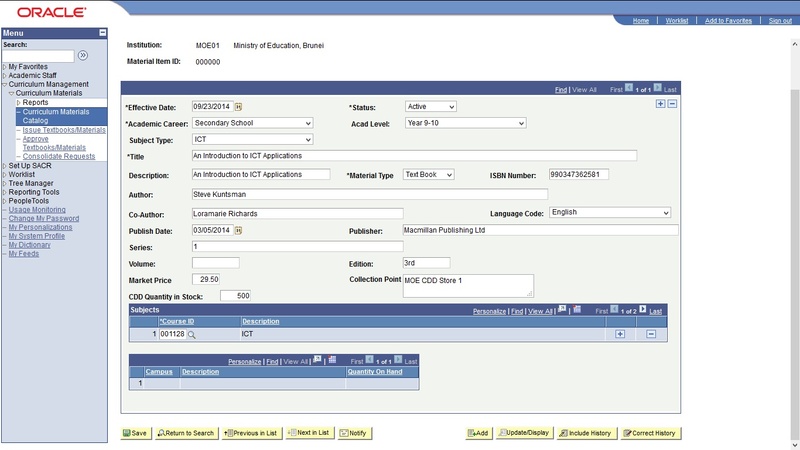 Navigate to Main Menu > Curriculum Management > Curriculum Materials > Request Textbooks/Materials. 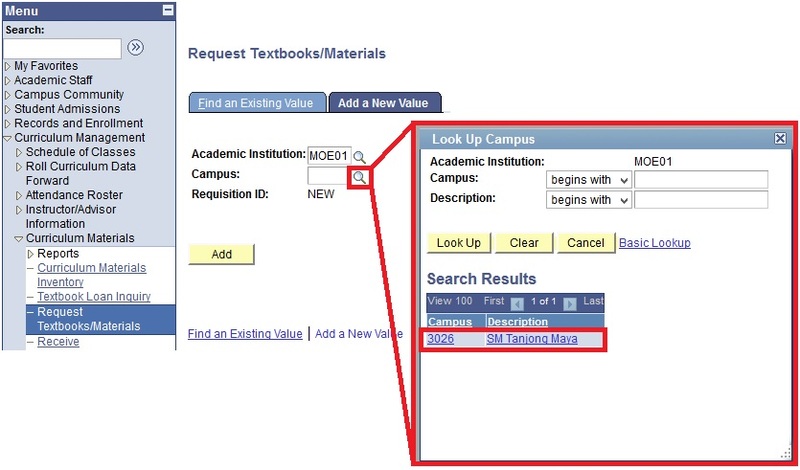 Click Add a New Value to submit a request for Textbook/Material. 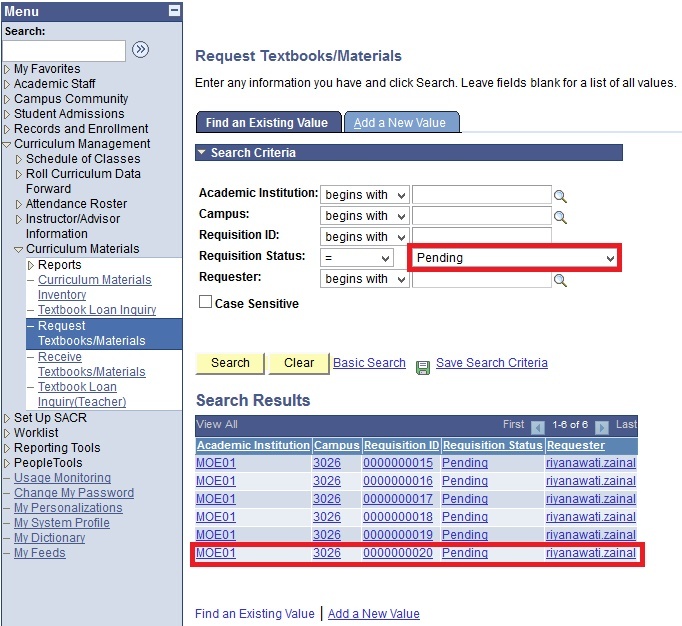 Select Existing Materials from *Request Type to request for additional textbooks which are found in the CDD's List of Approved Textbook. Select Item Id via Lookup button. Enter search parameters to narrow down your search result. 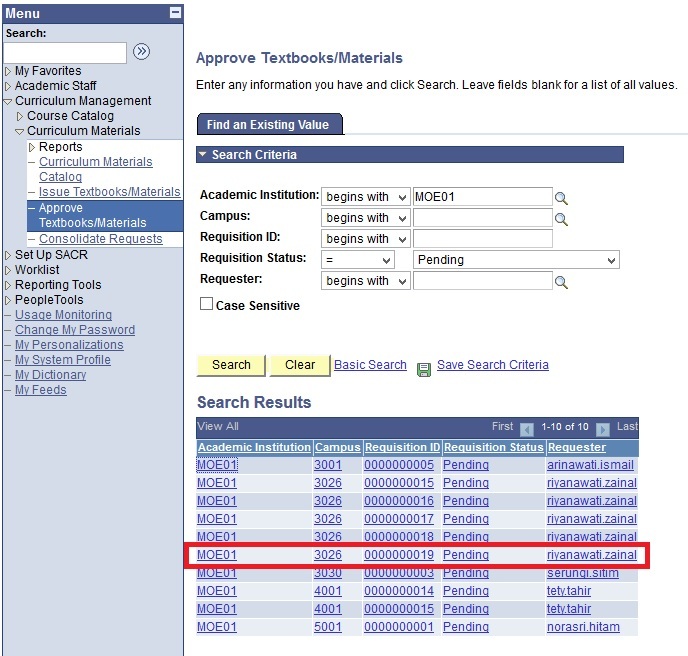 Enter the request details of the Textbook/Material into their respective fields. Columns with (*) must be filled in order to Save/Submit the request. 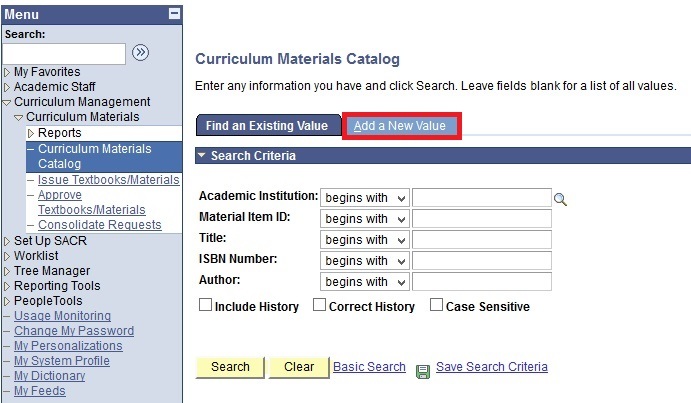 To add another Textbook/Material, click onto the '+' button and to remove a Textbook/Material, click on the '-' button. Click Save button to submit request. Email will be generated to CDD officer to inform them of the request made. School may request for multiple textbooks and submit multiple requests. 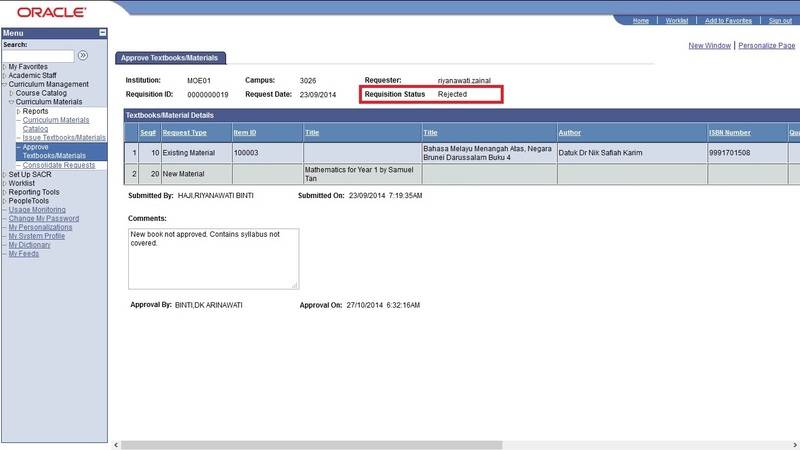 CDD may reject request if one of textbook in the request is rejected. CDD will indicate the rejected book in their comments. School will have to submit request again excluding the textbook which has been rejected. 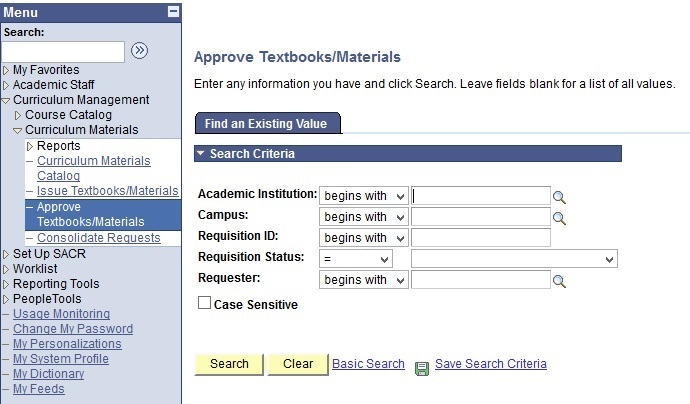 Select New Materials from *Request Type to recommend a new Textbook/Material to CDD. Enter the recommended Textbook Title into Title field. 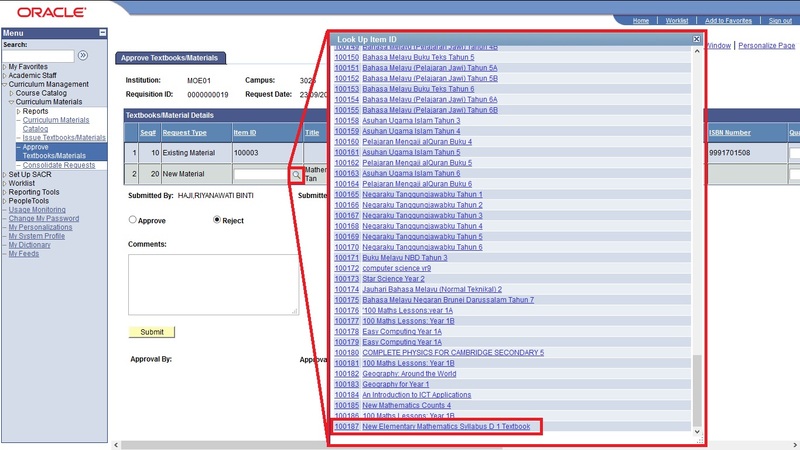 Select Pending from Requisition Status field to narrow down Search Result and click Search button. 'Cancel' button is available when Requisition Status is Pending. 'Cancel' button will not be available when Requisition Status is Approved, Rejected or Cancelled. User will have to contact CDD directly and provide them with the Requisition ID for reference if they wish to cancel request. Click onto desired Requisition ID link. A message box will appear to as for confirmation. Click Yes button to cancel request. Click No button to return to page. Requisition Status will be changed to Cancelled. Roles Involved: Ministry of Education - Department of Curriculum Development Administrator (PN1 and PN2). Navigate to Main menu > Curriculum Management > Curriculum Materials > Approve Textbooks/Materials. Click onto desired Requisition link. Select Approve radio button and enter comments if any. Requisition Status will be changed to Approved. 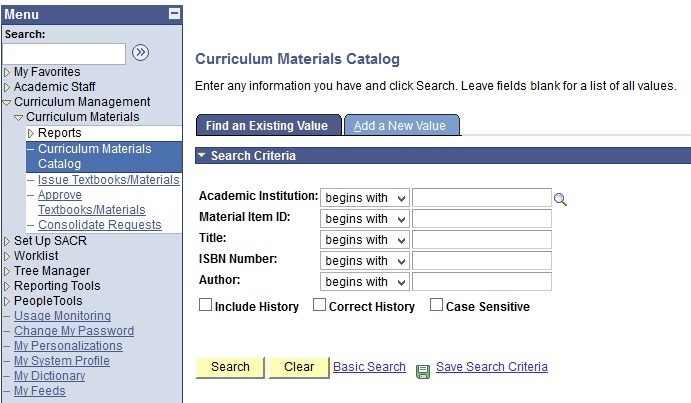 Navigate to Main Menu > Curriculum Management > Curriculum Materials > Curriculum Materials Catalog. Click on the Add a New Value to add a new tetxbook/materials. Fil in the Textbook/Material details into their respective fields. 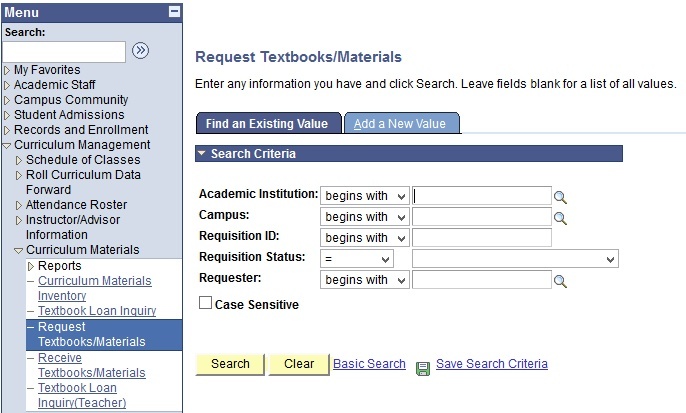 Fields with (*) indicates that they are required. User will not be able to save the page if any one of them is blank. Before Saving, Material Item ID is 000000. 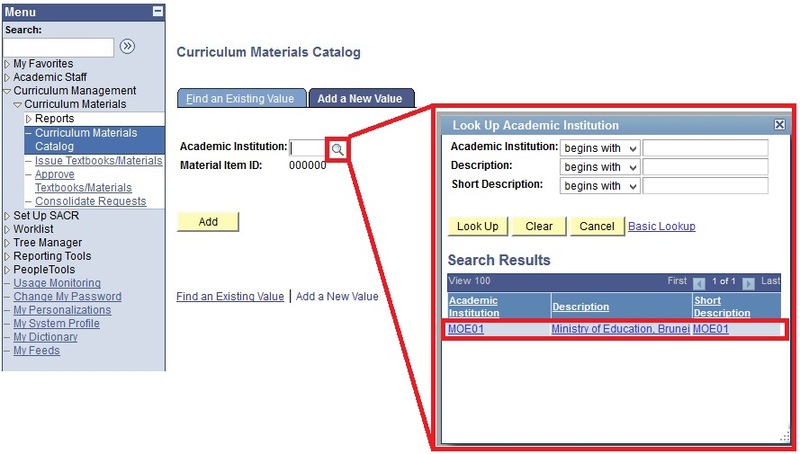 Select the Course ID via lookup button. Enter search parameters to narrow down Course ID. Take note of the Catalog Nbr value. Refer Course Details for explanation on Catalog Nbr. Course ID must be entered. If it is blank, Schools will not be able to view the list of books to be distributed to students. After saving, Material Item ID is auto-generated and uses the next running number. For New Material, click onto Item ID Lookup button and select the item ID that was just added in step 7. Select Reject radio button and enter comments if any. 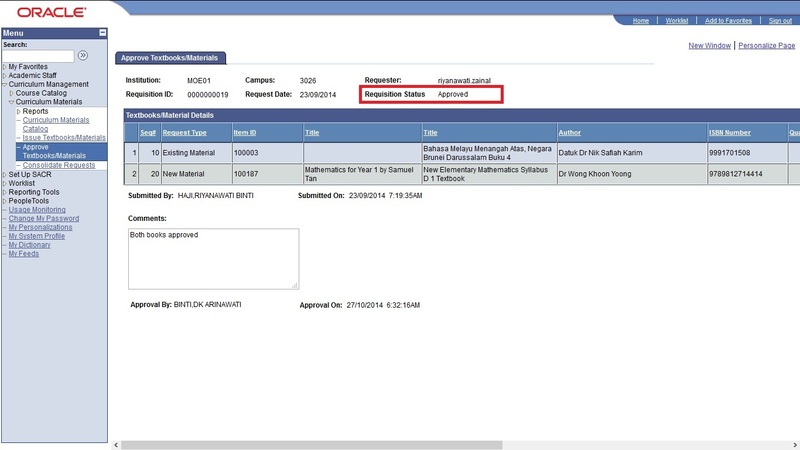 CDD may reject request if one of the textbook in the request is Rejected. CDD will indicate the rejected book in their comments and School will have to submit request again excluding the textbook which has been rejected. Requisition Status will be changed to Rejected.